At Dental Care Center LLC, we want you to have a smile you can feel good about. For many patients, this means replacing missing teeth with affordable and long-used prosthetics. Dr. Bouzis and Hokanson provide dentures in Gillette to help patients recover the appearance and function of complete smiles. If you’re looking for dentures near you, get started today by contact our dental practice. Full Removable Dentures - These restorations have been widely used for decades to help patients regain confidence in their appearances after total tooth loss. Modern denture treatments incorporate the use of tooth-colored and natural-looking materials to replicate the aesthetic of teeth and soft tissue, so your denture is a close fit to your smile. Drs. Hokanson and Bouzis personalize your treatment plan to ensure that your denture, whether intended for a top or bottom arch, looks great and fits comfortably. Partial Dentures - If you are dealing with sporadic tooth loss or have groups of missing teeth, a partial denture can be created to fill in only those specific gaps in your smile. Replacement teeth are attached to a metal framework that snaps into place or are part of a flexible soft plastic structure. When worn, partials seamlessly fill out your smile. We provide flexible and metal partials to suit patients’ need and comfort. Digital Dentures - For patients looking for a truly modern treatment option that make customization a more precise art, Dental Care Center offers denture fittings with digital technology. These prosthetics are cut with the help of special computerized equipment, as opposed to being cast from standard impressions. Digital dentures provide an excellent fit and improved durable, so you can enjoy a lasting smile. Fixed Dentures - Choosing to stabilize your dentures with a handful of dental implants can make a world of difference for both function and aesthetics. Implants fuse to bone and create the perfect anchors to affix a denture of any size. 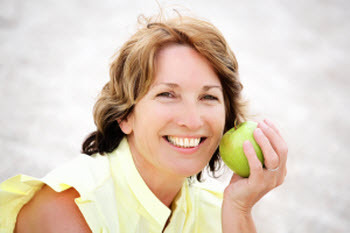 Learn more about permanent dentures by visiting our dental implants page. Our Gillette denture services are built around each patient. Our dentists never cut corners when creating your denture and are committed to make sure your prosthetics fit well and look great. We utilize a local lab that produces quality denture results, so you can feel confident in your treatment plan. We know how important it is to have a smile that looks and feels healthy. If you’re dealing with full or partial tooth loss, we provide denture options that fit your needs. Call Dental Care Center today to schedule your denture consultation at our Gillette, WY practice.